I held my 7th Big Fat Music Party the other week. These are my concerts that don’t feel so much like a concerts. I want to get away from the feelings of dread which seemed inseparable from performing to other people when I was growing up. I try and encourage as much collaboration between students as I can. It is great to find well known songs where the chord sequence goes round in a loop throughout. In the past we have had great fun with ‘The Lion Sleeps Tonight’. This time we had three new numbers like this where everybody could join in. I have written a blog about each one with ideas and downloadable charts. Hold the event in someone’s home. 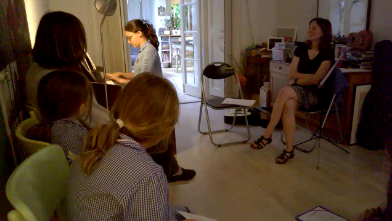 I initially asked the parents of some students who had a nice piano and large front room, and after that first one I had lots of offers from parents to host it at theirs. Have chairs around the edge for the adults and cushions on the floor for the children. This sidesteps the formality of rows of chairs and allows the young students to bond. Make younger siblings welcome. Let them dance and clap. Give them percussion for the big numbers. Ask quiz questions about the pieces being played. This started when I once noticed that a lot of my students were learning music from film and TV, so we held a grand Big Fat Music Party film quiz. I was amazed at just how much this increased audience attention! Now I throw in a question here and there about the music we’re listening to. It engages and relaxes them at the same time. Hooray! Get people to bring snacks so we can all have a good old nosh-up and chat afterwards. Quite often at this point a few children wander back to the abandoned piano and play music together. 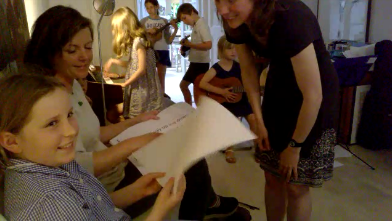 I must say that probably my favourite aspect of the parties is watching the connections form between my students and their families. I see my students getting to know each other and bonding over their common subject – music. They see the friends they met before, make music together, and get to hear what each other are playing. This is so important. Music should not be a solitary occupation for children. How could that possibly succeed? 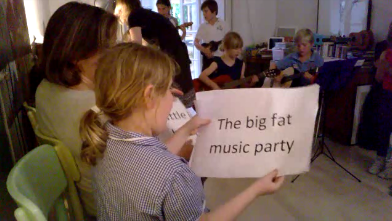 This entry was posted in guitar, music teaching, singing, ukulele, violin and tagged Big Fat Music Party, easy songs, fun music concert, music teaching. Bookmark the permalink. 1 Response to End of term = Big Fat Music Party! Terrific idea. I have recently moved to Sunshine Coast QLD, starting lessons mid year and was not sure whether to have my annual “concert” when so many students were new. I hired a clown, set up a low stage in a shopping centre, only had 4 students attend and we had a ball! 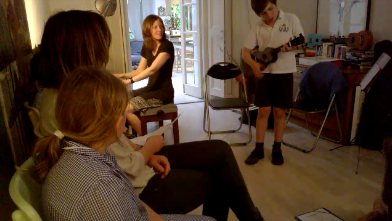 Luckily they played piano, guitar, drums and ukulele so the Musical Celebration was varied. Add a little clowning around and all the children really enjoyed their first public stage appearance and can’t wait for the next one in June.